You rarely see a kid with a fantastic ’do. 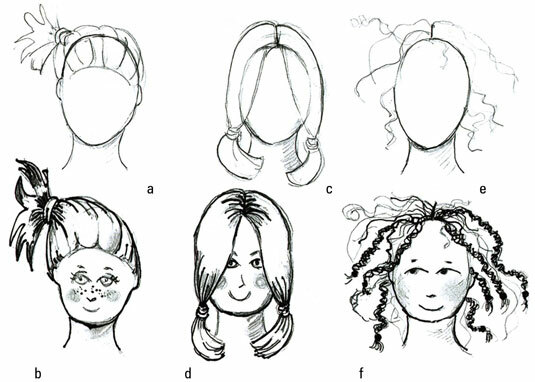 When you draw fashions for children, make sure your figures have simple hairstyles. In real life, you rarely see a kid with a fantastic ’do. After all, their main agenda is playing, and a parent’s goal is keeping kids’ hair easy to care for and style. A short cut is every parent’s dream, and it helps showcase your children’s fashion designs. A short cut on a girl tends not to go much past the ears; a short cut on a boy usually crops in pretty close to the head. Nobody’s hair lays like a helmet around the face. Add a few stray hairs on top of the head for a cute effect. Draw a circle for a kid’s head. Most children’s faces run on the round side, so a circle with little definition works best. 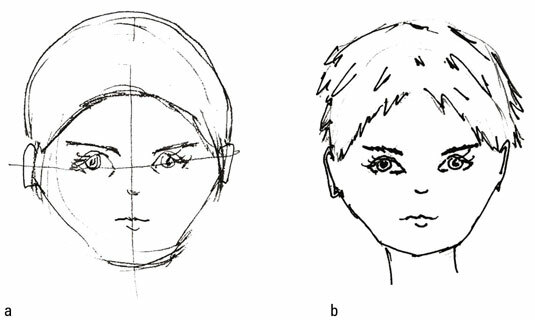 Sketch a curved line a little more than halfway up the circle across the forehead for bangs. Draw the hair visible behind the ears, ending just below the ears. Also add lines for the part. Make the ends slightly uneven so they resemble hair and not a helmet. Keep in mind that hair with bangs doesn’t have a true part, so draw a few lines downward and curving at the crown of the head to indicate that the bangs fall from that point. Darken the lines at the crown using a pencil point, and add dimension and value by using your pencil to shade. Add shine by leaving some white space. Draw a circle for a boy’s head. Add a face grid and facial features. Draw a the hairline curving up from the ears and peeking over the nose. Add jagged lines and blank spaces across the front of the hairline and along the outer perimeter of the hair, especially on the sides. Add a few broken pointy lines on the inside of the hair. Ponytails, pigtails, and braids are great for keeping hair out of a child’s eyes, and they also throw in a dash of fun that works for fashion designs. All these hairstyles belong to the same family. The hair is tied back differently in each style, but they all work with any little girl’s outfit. Draw a child’s head and add a hairline. Keep the hairline slightly higher than an adult’s hairline; children tend to have larger foreheads and heads in proportion to their bodies. Most children’s heads run on the round side, so a circle with little definition works best. Curve the hairline on her forehead to her ears. Draw a line above her head — the distance between this line and her eyes should be almost the same as the same distance from her eyes to her chin. Use parallel lines to show that the hair is pulled up from the sides to form a side ponytail toward the top of the head. After you’ve tied or clipped the hair up and back, hair flows from the tie or clip in an uncontrolled way. Add shading around the hairline of her forehead and the ponytail holder. Darken a bunch of lines around the ponytail holder and the ends to add dimension to her hair. Most children’s heads are rounded, so a circle with little definition works best. Draw the head from the front to show the pigtail action. Start with a center part, bring the hair down over the ears, and secure both sides with a tie or clip. From the bottom edge of the tie or clip, draw a series of parallel curves for hair that reaches above the shoulders. Add shading and darker lines around the center part and where the hair bunches up around the tie or clip. Draw a child’s head. Sketch a series of zigzag lines and loops and curves for a curly look. Most children’s heads are rounded, so a circle with little definition works best. Draw the head from the front with a center part so the braids show in all their glory. Add dark and light lines with loose and tight loops. Add a few braids by using two to three lines of tight loops on top of each other, moving together away from the head. Draw a bead at the bottom of each braid. After you master these pulled-back looks, you can adapt them in so many ways. You can place the pigtails higher on the head rather than closer to the chin, or you can pull braids up into a ponytail. Kids can have fun hairstyles — experiment!